Our new platform has a lot of new features, and many of you were asking for a more expanded list – so let’s dive right in! Here is a tour of the major new features in PhotoBiz 8. PhotoBiz 8 Tour from PhotoBiz on Vimeo. Building is now completely block-based. There are more blocks you can add, and existing options have been overhauled to look better and provide even more flexibility to build the way you want. Every page is now what we used to call a "custom page," and you jump right in. What's most exciting to me is how portable and modular your site has become. It's really is sort of like building with legos. You want to feature some blogs on your homepage? Sure. Pop a form on any page. Drop a shopping gallery anywhere. You have total freedom to build how you want (and it's easy to do). 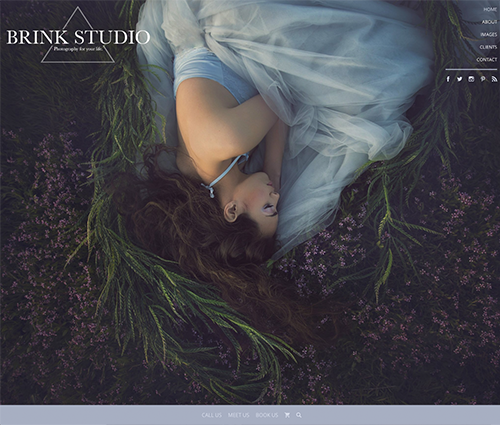 Our designers have whipped up 20 hot new templates that show off the versatility of PhotoBiz 8. Any design element or layout is possible on any template. These samples have been created by our team as a starting point, so you can easily swap in your images and text and publish your site. Take a browse through the templates and see which ideas you like best – then pick the one you want to start with. That site's sample content will load in for you to edit and customize. And more new designs are on the way! Yep! YOU GET A STORE! We've reconfigured our platform and products and decided to just give everyone on PhotoBiz 8 Ecommerce. So.... BAM! You can start selling your stuff online right now from an integrated store with ZERO commission fees. Basically, every block has received a design upgrade. 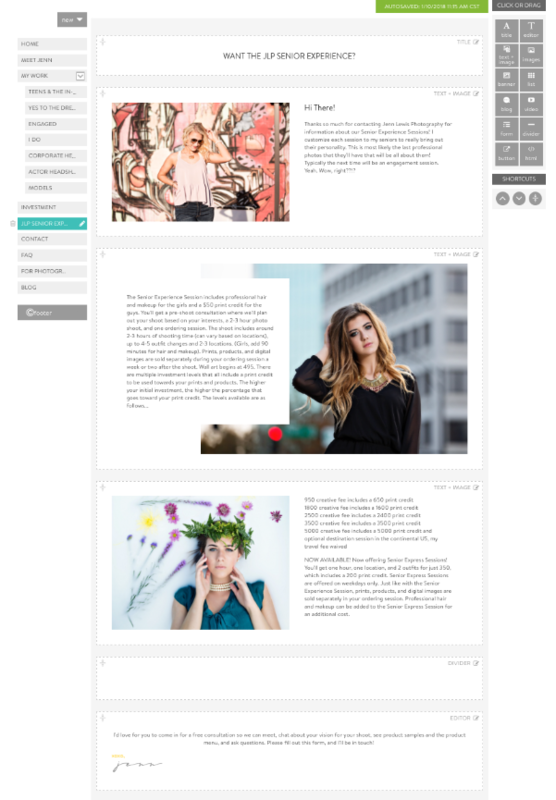 There are more image layouts (including 2 cool new slideshow layouts), funky overlays for text & images, WAY more list item styles (more about that in a sec), and more styling options in general. Each block can be fine-tuned and independently styled to make chunky, modern, fun designs that pop. Or, keep it simple and clean and let your design flow. You have tons of options here to make your work stand out. List Items sound kind of boring, but they're super cool and helpful for featuring pages and leading folks deeper into your site. Mix up images, text, videos, and links. Choose the exact number of columns you want and add elegant captions. Change color backgrounds, layouts, and change the shape of images automatically! Include a "last item link"
You can make your footer the way you want – HUGE with everything on it or extremely minimal – on any template we offer. You can add your badges, your logo, a signup form, social media buttons, your taglines, and hundreds of links if you want. Your PhotoBiz 8 site is all about getting you business. Site Links are brand new, and once you realize what they can do, they might be your new favorite thing. See those extra links that say "CALL US" and such in the top right corner of our Rockwell template? You can put specific CTAs or icons there (like a phone, for click-to-call functionality) that let customers know immediately what to do and how to get in contact with you. On Hemingway, we put the photographer's location, so customers know right away where they are located. You can put ANYTHING YOU WANT there! It's a space for you to communicate important things instantaneously on every page of your site. FX banners have evolved! Now you can add live text overlays to the banner with buttons. You can make a BIG STATEMENT that looks better, is more customizable, and works harder. Embed a form on any page and pair it with an awesome image if you like for extra impact. Proofing comes with all websites and now includes the ability to sell prints, products, digitals, and packages right from your proofing galleries. All commission-FREE! Everything is integrated and streamlined, giving customers an awesome online ordering experience and speeding up orders for In-Person Sales. Mobile sites are fully responsive, taking your live site and displaying it brilliantly on mobile phones. Menus look better, images and words are optimized for mobile display, and your site arranges itself to be the best version of itself no matter what device it's being seen on. Our Auto-SEO engine will write your metadata for you using your page content... or you can write and customize your own. You can also now add alt-tags to images, use friendly URLs, and add page-specific or global tracking. Pages load faster too! Whoof! That's a lot of updates. And there's more planned. Site-wide SSL, Global Caching & CDN delivery, Microdata / Open Graph Data, and pop-ups and sticky bars for marketing are coming in the next few months, plus more templates! Stay tuned to the blog for more release notes and updates. John Kalad - Looks like another awesome improvement. Can’t wait to switch to 8!